But seriously folks, the chowder is perfection, the right balance of fish to other ingredients and light enough to be enjoyed even on a hot summer day like today. 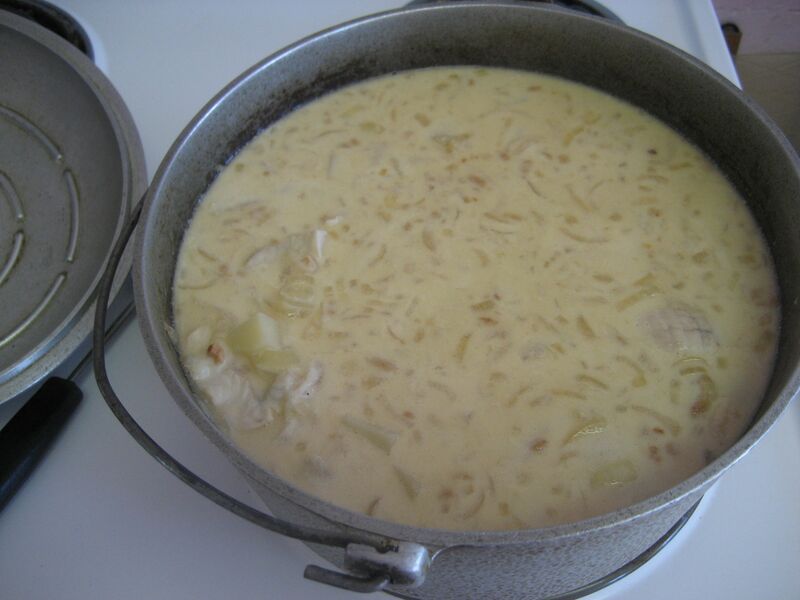 Sacrilege in this Rhode Island family is a summer without a batch of Aunt Blanche’s fish chowder. 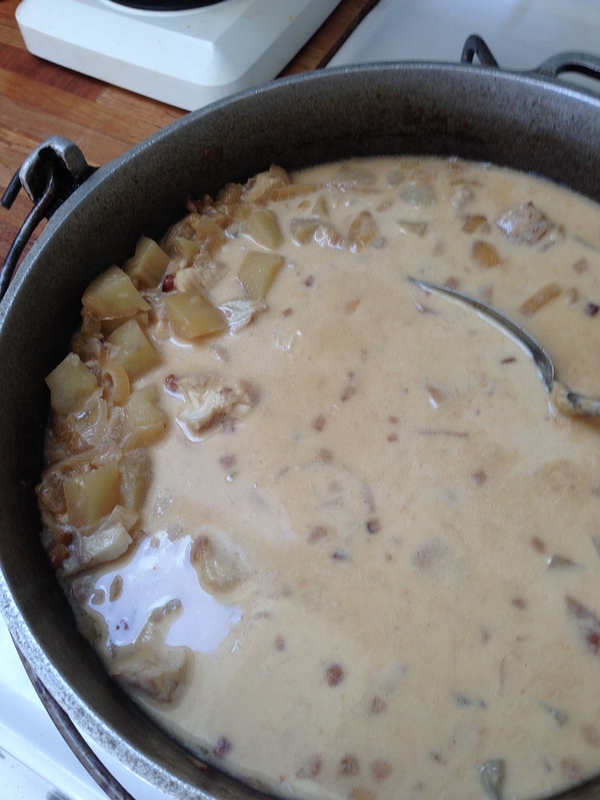 With our own garden potatoes in hand and several freshly caught tautog today, only the milk, salt pork, and onions are needed from the supermarket. 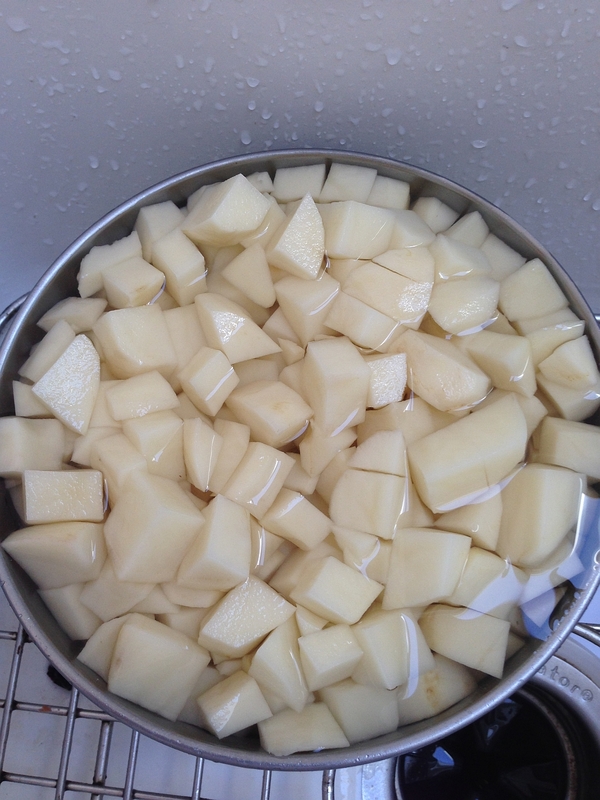 It’s a simple chowder, but the real ingredients are not so obvious: my grandmother’s kettle, her wooden handled fork for testing the potatoes for proper mouth feel, and when my mother was still alive, her decree that the potato cubes in a proper chowder have no eyes and that the onions be cooked to a golden brown. 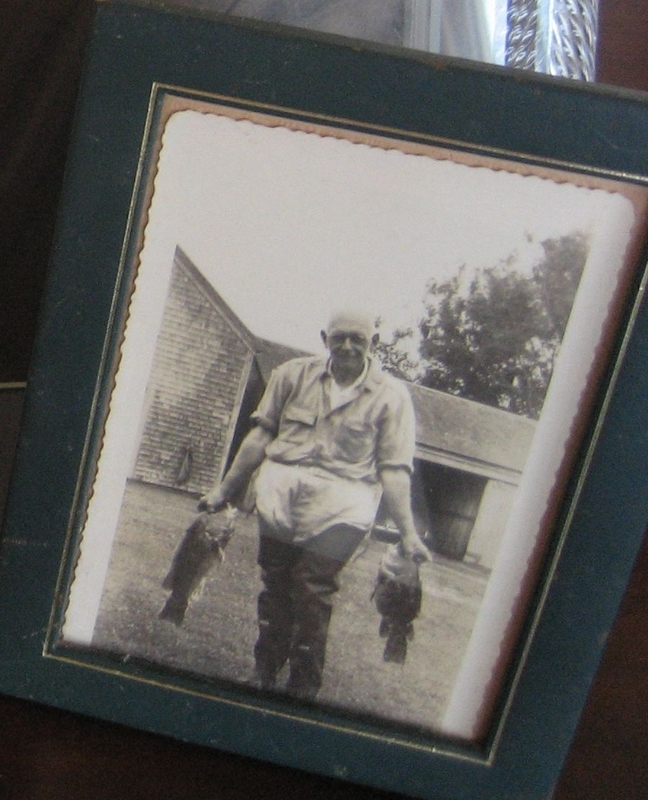 My grandfather taught me some 65 years ago how and where to catch and clean the fish. Without their participation today, this might as well have come from a can of Snow’s. And as always, you get a nickel if you find a fish bone in your bowl. I’m conveniently out of nickels today, but I’m pretty sure it won’t matter! Starts with Mr. EOS fresh caught tautog. 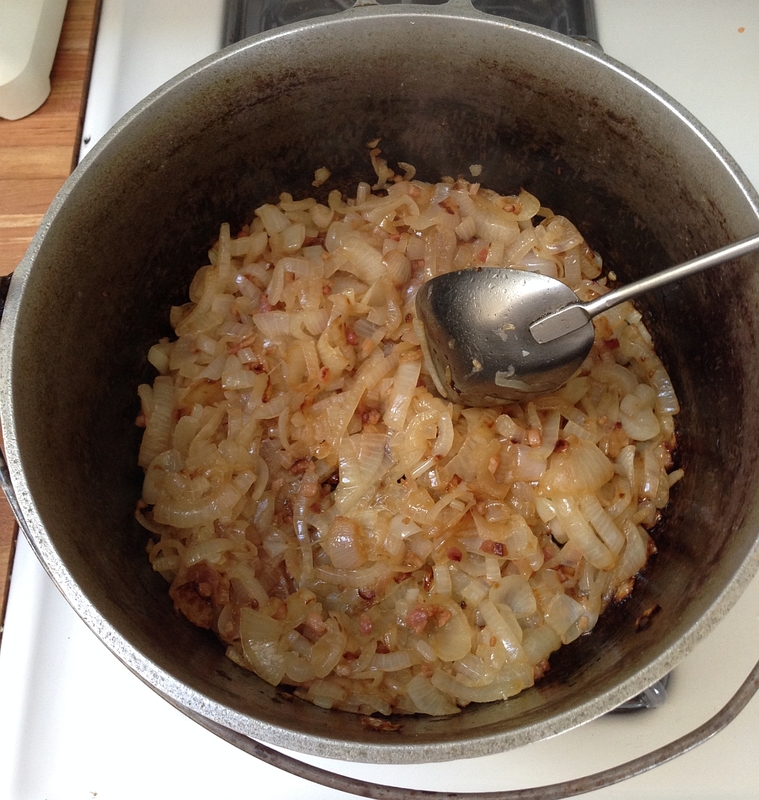 Thinly slice and saute onions in a hunk of salt pork and only salt pork. No substitutions. Add a couple o’cans of evaporated milk and some agua, let it bubble and perk til all the flavors meld, but not so long that the fish dissolves, then slurp it up and enjoy. As with most soups or stews, it’s better day two or three. Mr. EOS still fishes from the same rock where his grandfather took him. I say that’s quite the legacy. Ya’ll better get up here quickly to get a bowl of chowder before it’s all gone. BYOTP! The photo of old granddad is priceless. Thanks for sharing a great family recipe and story. The post headline- EOS winner!!! The SNL skit of the same name is still a favorite. Funny. I wish I knew Mr. EOS back when I was The Soup Lady. You’ll need to fill me in Cripes. I haven’t known you long enough to know you WERE The Soup Lady. Do tell!! A long time ago, before food blogging was such a serious thing, I had a blog dedicated to soup – the Joy of Soup. It was more of a humor site rather than a serious recipe site and The Soup lady was sort of an Aunt Blabby character. It was really popular but then it became like a job instead of an outlet for me. Commenters on food sites were hyper critical then and always wanted to debate me about using 1/4 tsp of a seasoning vs 1/2 tsp. And people were furious about punctuation there. Plus I got a Cease & Desist letter from the Joy of Cooking publishers, who believe me! have very little joy in them. I haven’t written there in 10 years but the thing still lives and I still get argumentative emails about what’s written there. Now other internet people claim to be soup ladies and other sites call themselves joy of soup. I’m okay with that. Who knew!? I can tell writing comes easily to you so no surprise that you were blogging way before the rest of us. Cease and Desist, what a compliment. That says you were writing better than their editors! Great story. Thanks for filling me in!! Mr. EOSr is a man after my own heart. And obviously very talented. He understands protocol and tradition. AND he is properly cooking with a cast iron pot. YES!! But I must admit, the fact that he sometimes cooks with a microwave disappoints me, but we all have our weaknesses, correct? MICROWAVE FOOD BLOWS!! SOUSE VIDE!! I use a spatula handed down from my mommy’s mommy. IT’S GREAT!! And the chowda looks terrific. But I would put in some crumpled bacon. Lucky for Mr. EOS, he has me to cook for him. But when he’s in RI construction mode, hunkered down in a temporary house he calls his Shedteau, the amenities are minimal. He really can’t cook unless it’s either nuked or BBQed. It’s not his first, second, or third choice, but it is what it is until the Carriage House is habitable. The recommended topping for the chowder is oyster crackers but I like bacon better. Gives it a good crunch factor. Even better is fried salt pork “jimmies” to float on the top. Makes ALL the difference between a good chowder and a SUPERB chowder. That recipe has motivated me. THANK YOU MISTAH EOS! Oh yeah, chicharrón! They are delicious. Yes please. WHERE DID YOU FIND THAT?????? I’m laughing my head off. It’s like an old Second City skit, Second City being my all-time favorite improv troupes. I used to watch them waay back in the 1970s – Eugene Levy, Andrea Martin. If you don’t pee in your pants watching this, you’ll never be my friend. Eugene Levy is one if the most underrated comedic genius of our age. He was king of SCTV. He did a movies later but I would have predicted more from his career than American Pie stuff. His foil was always Andrea Martin, also pure comedy gold. Nothing is harder than improv. Great clip. Save me some chowder. If I leave Miami now and catch the next plane to Providence, will you come pick me up? Isn’t spatula such a great word? SPATULA! SPATULA!! SPATULA!!! WHO INVENTED THAT WORD? I am guessing a WOP… ends in a vowel…maybe Leonardo? That guy was really smart. And a homo BTW. NTTAWWT. But…. BUT!!! If he was so smart, why did he waste SUCH A GREAT WORD on a kitchen utensil? It could describe almost ANYTHING!! Would you like to see my spatula? I bet my spatula is bigger than yours. I would really like to slip her my spatula!! Do black guys really have bigger spatulas then us white guys? IF SO STOP COMPLAINING!! AND SHOOTING EACH OTHER!! What are you mad about? You have big SPATULAS!! I love WORDS!! FONDUE!!! IT’S PERFECT!! And I don’t even know what it means. Does he know how to properly cook a hot dog? Probably not, but he does grill a mean steak. His grilled chicken, on the other hand, a tad overdone….and dry. Oh well, we aren’t all perfect. ive never seen tautog for sale. is it not marketed outside rhode island? bacon is good on anything. 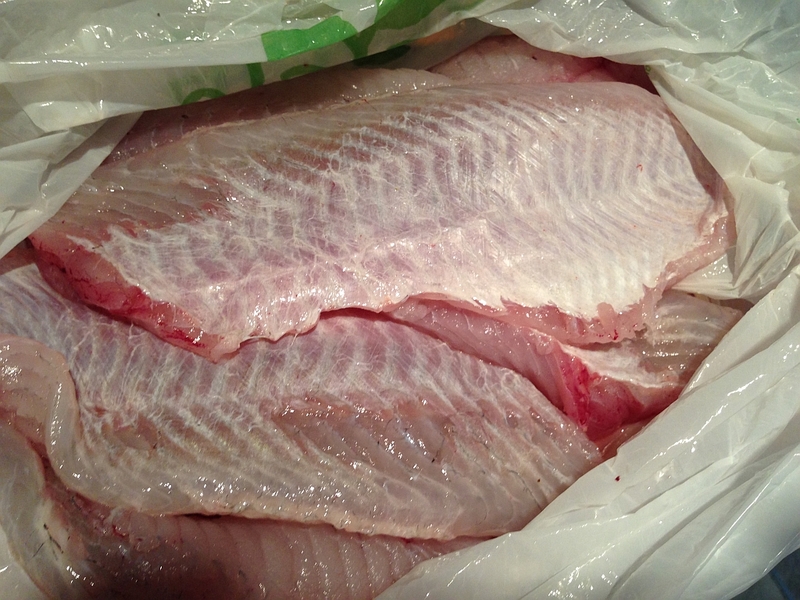 Tautog is your basic bottom feeder, not a high priced fish that mongers want to display. 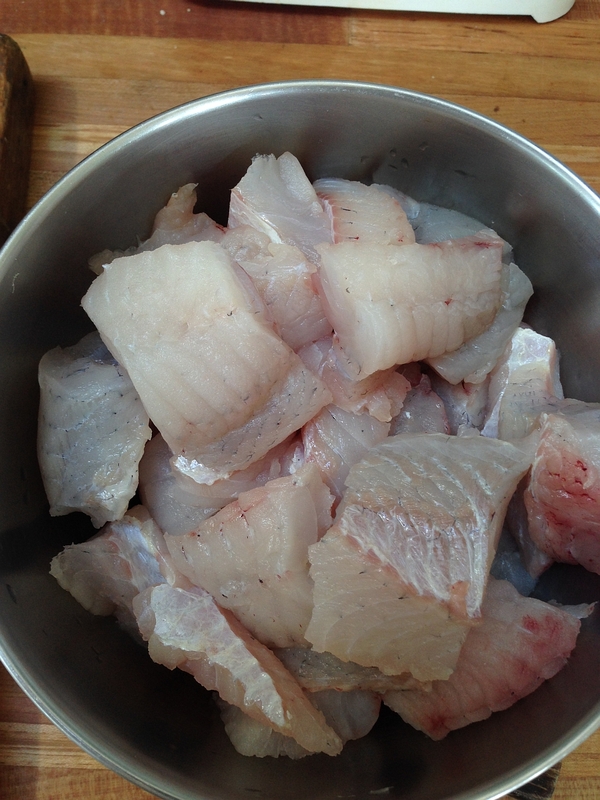 It’s good solid white meat that’s perfect for the chowder and makes for yummy fish tacos too. Pan seared after being lightly rolled in johnnycake cornmeal is good in the winter months. From what rock does he fish? Soup sound delicious! I’ve caught them off Captain’s Island, you know the one with the light house, and at the picnic area at Tod’s. They like to eat crabs like those small green ones you can find under the rocks at low tide, so probably any rocky area, great places for snagging your line, will do. okay, i give up. what is the secret ingredient that gives the recipe that special fire in the hole goodness? Good question. Mr. EOS has been consuming this chowder much longer than I. Let’s ask him. The secret ingredient must be the chunk of salt pork rind tossed in after the tiny cubes of it have been cut, making the aforementioned “jimmies”. If they get burned, throw ’em out and start over. phew! that knocks out my theory that the ‘rock’ is a tad too close to the Little Compton Water Reclamation plant. Speaking of BBQs here’s a story of a Florida man who was order to keep the smoke and smell confined to his own yard. Huh? Is it a) in a different kitchen, b) on loan to the Smithsonian, or c) gone for good? The range top wasn’t pink, it was the kitchen cabinets and walls in Mr. EOS’s mothers home. After her death, the house went through a major upgrade, only one big pantry cabinet saved and repainted. So no more pink. Funny you should mention old kitchens because I just asked my first cousin to hunt down photos of my grandmothers Ohio kitchen with black and pink tile countertops and a top loader dishwasher that never got used. It’s long been deep sixed but I think of it often, with such fond memories.